This post is about who voted for Modi. I had been thinking of writing about this for long. Because I believe that Modi supporters are a far more heterogeneous group than that of these alleged intellectuals, who are mostly incestuous group-thinking cabal. 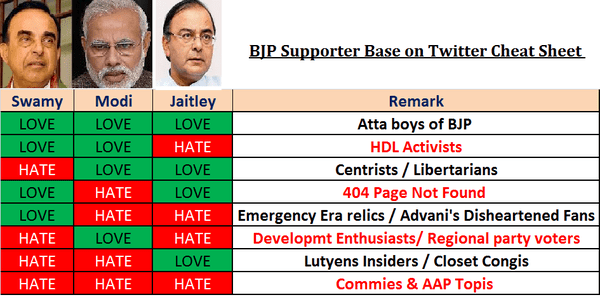 A couple of months ago, I got this matrix description (the image above) of BJP support base on Twitter. It was made by Twitter user @gajamani, and it rightly defines the spectrum. But I intend to stick only to the Modi support base. I would categorize the supporters under some fancy names I can think of, and would define the respective category’s attributes based on the following parameters – their outlook towards market/economy, their outlook towards minorities (mostly Muslims and sometimes Christians), their outlook towards Hinduism, their outlook towards Hindutva (read Sangh Parivar), and their outlook towards Modi’s role in 2002 Gujarat riots. Not a fancy name, but kind of self-explanatory. He identifies himself as right-liberal (as opposed to left-liberal). Could as well be seen as ‘fence sitters’ by other groups. Markets: Obviously supporting free markets and capitalism. A fan of “minimum government maximum governance” mantra. Mostly loves the corporate India and hates AAP. Believes that Modi can transform economy and make it competitive. Minorities: Mostly carefree. He could have reservations about Islam, but not necessarily prejudices against Muslims. He would be willing for a dialogue and co-operation with the community, but not to carry out some pro-Palestine and anti-Israel protests. Would prefer Christians over Muslims. Hinduism: He identifies himself as Hindu in a cultural and spiritual sense. Or he could be an atheist as well. Rarely will he be a practicing Hindu with belief in a personal god who answers prayers. Won’t know much detail about the religion per se, but will have a sense of belonging. Not in favor of organized religions. Free speech supporter. Hindutva: He would prefer to keep away from Sangh Parivar, especially the “affiliated” outfits. His idea about Sangh would be mostly influenced by popular opinions as spread by the mainstream media, but he won’t be allergic to the RSS. He will prefer Sangh to work under Modi, rather than the other way round. 2002: He thinks Modi is not culpable or complicit. He gives a clean chit to Modi for his personal involvement, but his failure as an administrator is acknowledged. He feels that Modi was not in control as he was made the Chief Minister as a compromise candidate just a few months prior to the riots. He could either see it as a “genuine” riot due to the Godhra train burning incident, or believe that likes of Togadia organized it. Markets: Swadeshi. He is not a capitalist, but definitely not a communist. A protectionist maybe. He would believe that if no restrictions are in place for an MNC, it will turn into an East India Company. He thinks Modi will bring sustainable development and help domestic entrepreneurs. Minorities: Conscious of their presence around. He prefers the Muslims and Christians to acknowledge, if not celebrate, their Hindu ancestry. Suspicious of puritan Muslims and Christians and their motives. He too will be willing to communicate and co-operate with the community, but at his own terms. Hinduism: He is not a big fan of the Hindu libertarians, whom he thinks to be confused people. He will prefer a religious Hindu over and above a cultural-spiritual one. He will want people to respect Hindu rituals apart from the Hindu philosophies. He will want to make the religion more organized. Hindutva: That’s what defines him. 2002: He thinks that Modi did whatever best he could do in those times. He won’t blame Togadia, but will blame the circumstances. He will never allow the riots to be discussed without Godhra being brought into the context. His main identity and concern is his community – whether in religious or cultural sense. He believes that Islamic fundamentalist and Christian evangelism will finish off Hinduism if proactive steps are not taken. Markets: Could be a swadeshi or a capitalist. He’s too paranoid to care about these things. He’s happy to know that the economy is not as bad as it was earlier. He’s not looking at any particular target for GDP growth rate. Minorities: Distrusting people with non-Hindu names, especially those with noticeable religious manners or attire. He will love gharwapasi of these, but not by force. His paranoia will subside a little when he’d see a Muslim family organizing Ganesh Chaturthi puja, but the next Friday prayers or a Milad-un-Nabi procession will scare him back into paranoia. Hinduism: He will have a newly found respect and love for rituals. He is trying to become more religious. He dislikes PK, the movie, especially after reading online comments. He looks at Modi as someone who’d provide the leadership to the community. He is not yet ready to accept the leadership of any baba or sadhu. Hindutva: He is fascinated by it because his pet-peeves hate it. He is trying to know more about it. He believes this ideology has to be strengthened if Hinduism has to survive. He doesn’t have much idea about what it means though. 2002: He believes it was a “natural” reaction to what Muslims did to Hindus in Godhra. He believes that it was unfortunate, but had it not happened, Muslims would have burnt down every Hindu household by now. He doesn’t believe that Modi organized the riots, but he thinks Modi allowed Hindus to vent their anger, and he thinks Modi did the right thing. HDL stands for Hindu Defense League. He’s hyperactive on Twitter, and also visible offline occasionally. He’s the extremist. He’s the fundamentalist. He’s angry. Markets: Couldn’t care most of the times, couldn’t understand rest of the times. Minorities: He can’t understand why Muslims are there in India when Pakistan was created for them in 1947. A Muslim or Christian is a violent extremist unless proven a moderate pacifist. He can accommodate Muslims and Christians if and only if they respect Hindus and Hinduism as elder brother. Gharwapasi is the best solution. Hinduism: He wants Hinduism to be as organized as possible. He hates Islam, but he is impressed with the way Muslims love their religion. Irrespective of what Hinduism may mean, he wants Hindus to respect and follow Hinduism the way a Muslim follows Islam. He’s obsessed with Muslims, and gets obsessed with Christians to take a break. Hindutva: He shapes the popular opinion about this ideology, even though he may not be representing it. 2002: He believes Modi did it, and he is proud of it. He will be crestfallen and will stop supporting Modi if someone convinces him that Modi was not actively involved, or worse, he tried to control the riots. He believes the riots were justified and Muslims needed to be taught a lesson after what they did in Godhra. He is a person who hates Congress for various reasons – for the corruption, for their left-liberal ideology, for the dynasty, for what the party didn’t do despite being in power all these decades. Markets: He is fine with free markets, though with some regulations. Although he hates Congress, he believes that mixed economy is the best; Congress screwed the implementation. He believes Modi can set things right. Minorities: He has no ill-will towards Muslims and Christians, but he believes that Congress followed appeasement policies that created rifts between Hindus and non-Hindus. He acknowledges that Muslims have some problems such as radicalization, but he blames Congress’ policies rather than Islam or the community per se. Hinduism: He has a sense of belonging as a Hindu. He could be anything – a ritual following Hindu or an atheist. He is not ashamed of being a Hindu. Hindutva: He distrusts RSS and other organizations, but he doesn’t hate them. He acknowledges the humanitarian and volunteering work of RSS, but doesn’t want the Sangh to go beyond these activities. He doesn’t know much about what Hindutva means, nor is interested in knowing. 2002: He is “let the courts decide” fellow. He doesn’t have any definite opinion about Modi’s personal role in the riots, though he surely calls the riots a black spot on Indian history as well as on Modi’s career. He thinks Modi is as much responsible for 2002 as Rajiv Gandhi was for 1984, and he wonders why Modi should be treated as pariah while Rajiv is celebrated as messiah. He believes that Modi has put that incident behind him and others should do the same. Yes, he exists. And he is not defined the way the alleged intellectuals define him. He loves Modi, the personality. He loves Modi, the idea. He is to Modi what Ramchandra Guha is to Jawaharlal Nehru. Markets: Modinomics. He’s mostly free-market types, because Modi appears to be that type. But if Modi supports some protectionist ideas, he too will support it. Minorities: He goes by what Modi says. If PM Modi has said that communal tensions have to be forgotten for 10 years, he is willing to. Though his outlook towards the minorities is somewhat similar to that of a Sanghi, Modi’s thoughts and speeches will define his emotions and passions. Hinduism: He is a proud Hindu. He has a picture of Swami Vivekananda somewhere in his home, or in his laptop. And he believes that Modi is the person who will finish the unfinished work of Vivekananda. And Modi knows what that unfinished work is. Hindutva: It’s Moditva for him. 2002: He believes that Narendra Modi is innocent, who did everything to stop the riots, but the anger of people was too strong that some casualties (the official figure) happened. He believes that the potential deaths and destruction would have been much higher if Modi had not acted. He also points out that Digvijay Singh and other neighboring Congress governments didn’t help Modi by sending additional police forces on time. I think one can “broadly” categorize Modi supporters into these six types. Now I’m not a typical journalist, else I’d have even put some percentages with certitude, claiming with confidence that 10% of Modi supporters are Congress Haters, 20% are libertarians, and so on and so forth. I will leave that on you guys. But one thing is for sure. There is hardly any Modi supporter who has an agenda that doesn’t have a “Hindu” element in it. Obviously there are various degrees to it. To suggest that those with “Hindu agenda” and those with “Development agenda” are disjoint sets is unfounded in my opinion. Nonetheless, the idea was not to jump into this Hindutva vs Development debate, but to share my views on various types of Modi supporters, who are painted as a homogenous group by alleged intellectuals. This Hindutva vs Development gave me an excuse to write this post. I’m not claiming to be the real intellectual who has the final word on the topic. I’m sure there would still be some Modi supporters who’d not fit into only one category, and they could share some attributes from one category and rest from others. However, I do believe that these six categories cover almost the entire spectrum of the support base. Do let me know your views, and do let me know which Narendra Modi supporter are you? And if you can create a BuzzFeed type quiz based on this, don’t forget to credit me! Previous Previous post: Due to internet, can the journalist vanish like the postman? Next Next post: If we are done critiquing the cartoons, can we now critique the faith?